On the water's edge overlooking a central lake, our stylish, fully equipped & immaculately maintained luxury home is perfectly located for your Florida vacation. * Master with king bed and luxury ensuite bathroom with roman tub, walk-in shower and his 'n' her wash basins. Telephone, 42' color cable Plasma TV with DVD. Sliding glass door to the pool area. * Second bedroom with queen bed, 32' color cable LCD TV/DVD and shared family bathroom. * Fourth bedroom twin bedded situated next to the master with sliding glass door to the pool area. 26' Color cable LCD TV/DVD and PSP 2. Adjacent bathroom with large walk-in shower. All the bedrooms have ceiling fans & ample storage and quality towels are provided in all the bathrooms. All our rooms have designer furnishings and decor. There is a dining room and attractive spacious family room with sliding glass doors to the lanai and pool. In the family room there is a 55' Plasma color cable TV, DVD and quality Bose Cinema Surround sound system. Library of over 100 DVDs for our guests use. Free Wifi internet access available. All pool doors have child safety alarms. Our home also features a large fully-equipped luxury kitchen with breakfast nook, large American refrigerator, microwave, dishwasher and cooker - all of which have been upgraded over the last couple of years. Quality utensils and crockery are supplied. In addition to the breakfast nook there is seating at the breakfast bar. The separate laundry room has a large front loading washer and dryer, iron and ironing board, everything you need for your home from home. The foyer, kitchen and laundry room are fully tiled. 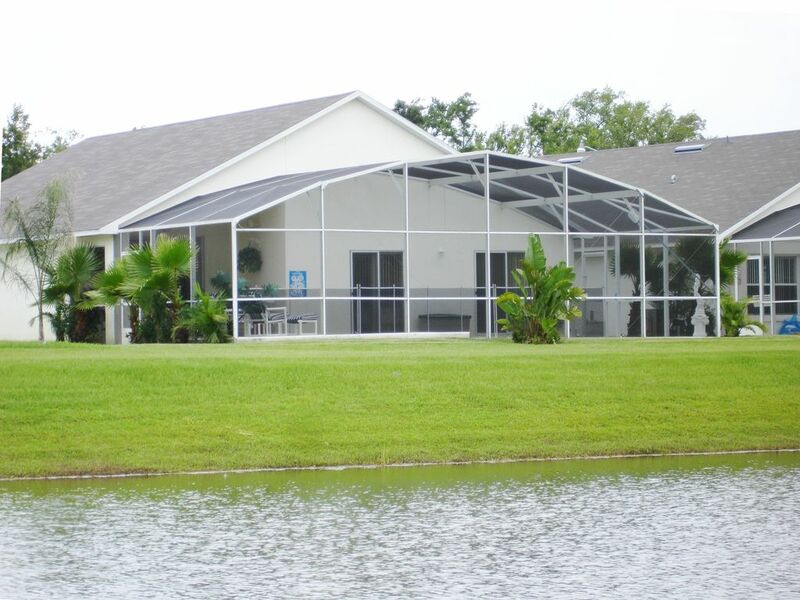 Our FANTASTIC designer heated pool and raised Spa overlooks the lake and has an over-sized split level sunny screened decking area - just right for you to soak up the Florida sunshine or - if it's shade you need - sit under the lanai with it's ceiling fan. Pool towels are provided. PICTURE taking an evening dip in the spa, drink in hand, watching the evening sunset over the lake - then dinner by the pool under the moonlight. All this set against the backdrop of your very own ‘light show’ – courtesy of our 4-color fibre optic UNDERWATER POOL & SPA LIGHTING! It is not quite as spectacular as our ‘neighbours’ at Disney World but it provides a restful and picturesque setting from which to marvel at those amazing Florida sunsets. Free standing modern stove/oven. Oven has self clean facility.